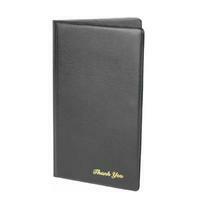 Black with gold imprinted "Thank You"
This check presentation cover has pocket inserts to hold checks, cash and credit cards. A kind "Thank You" is also imprinted in gold on the front cover. Dimensions: 5.75" x 9.5" x 0.5"